The nature of Krishna-prema is such that it is only entrusted into the heart, of visuddha bhaktas of Krishna and it has no other dwelling place. It is passed from one atma to another, just as lightning passes from one cloud to another. Gradually, by associating with Vaishnavas, the prema in the Vaishnava’s heart is naturally transmitted to the heart of the jiva. At that time wicked tendencies are removed from the heart of that jiva and a saintly nature manifests in him. Very few people know the extraordinary contribution of Srila Bhaktivinod Thakur to the revival and reestablishment of Lord Sri Chaitanya’s mission on this planet. After the disappearance of Sri Krishna Chaitanya Mahaprabhu and His associates, a dark age descended on the world. Those unable to understand the transcendental mission of Lord Sri Chaitanya started numerous apasampradayas, or deviated philosophies. Educated upper class society was shocked and disgusted by the practices of these heretical sects and came to mistakenly identify Lord Chaitanya’s religion with the uneducated and immoral. People were thus losing faith in Lord Chaitanya’s true mission. The most munificent incarnation Sri Chaitanya Mahaprabhu took pity on these bewildered souls, and in order to reclaim them for His path of divine love sent his eternal associate Srila Bhaktivinod Thakur into this world. Possessed of superhuman prowess, Srila Bhaktivinoda Thakur wrote more than a hundred books in several different languages with the goal of defeating all the unorthodox views opposed to the true doctrines of Sri Chaitanya Mahaprabhu’s religion. The following is taken from Srila Bhaktivinod Thakur’s book “Bhakti Tattva Viveka”. It teaches us how to look into our hearts and recognize our own shortcomings. 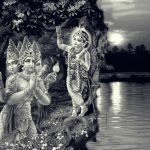 Unless we introspect and understand the anarthas or unwanted desires buried deep within our hearts, and unless we carefully get rid of each and every material desire, it is not possible to achieve the ultimate goal of human life, which is getting liberation from the clutches of Maya and engage in the loving devotional service of the Supreme Lord Krishna. Srila Prabhupada explains that if one cannot get rid of material desires, he can dovetail them in the service of Lord Krishna and thus purify them. 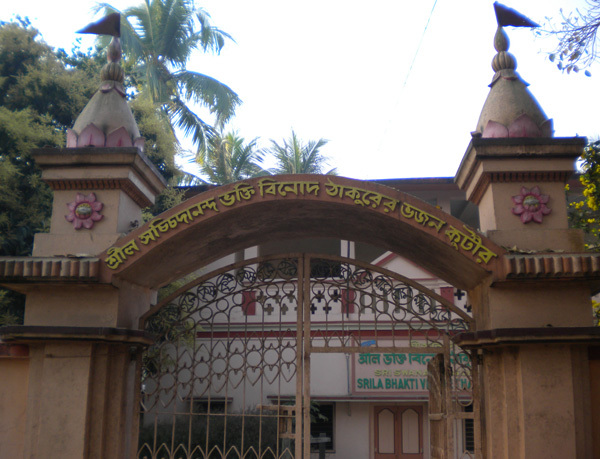 Srila Bhaktivinod Thakur’s Bhajan Kutir at Godrum dvipa. To the degree that we endeavour to develop ourselves spiritually, to become religious, to maintain a renounced life, and to deliberate on and discuss jnana, we desire our own pratishtha (honour and distinction). This desire contaminates our hearts and pollutes our characters. Although we make a great effort to control lust, anger, greed, illusion and envy, and although we perform severe austerities to control the senses, concealed within our hearts the desire for pratishtha, in the form of a wild infant animal, continues to grow. I learn ashtanga-yoga with a desire to become a famous yogi. But if anyone one tells me that my yoga lessons are merely… a show, I burn in anger. I discuss and deliberate upon many sastras in my endeavour to merge into brahma. But if I hear someone say that this process is… fruitless, my mind becomes disturbed and I condemn the accuser. We learn ten kinds of dharma, such as control of the mind and the external senses, austerity and truthfulness, and in carrying out our worldly activities we perform daily obligatory religious duties (nitya-karma) and occasional religious duties (naimittika-karma). But if someone says that karma-kanda is simply… useless labour, my mind suffers; I become unhappy because my pratishtha is being made to appear insignificant. When the karmi, jnani, yogi and so on search in hope of attaining the fruit of enjoyment and liberation, how can they have any peace? They cannot relinquish the desire for pratishtha. This desire is very insignificant, however, in those Vaishnavas who have no thirst at all for bhukti and mukti. 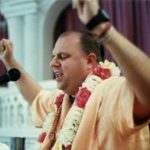 Nowadays, the acaryas of vaishnava-dharma cannot tolerate the slightest disrespect. From the outset, they endeavour to enhance their dignity by placing their feet on the heads of all. It is not unreasonable for an acarya to receive respect from others. But if he courts that respect for himself, where is his real value? Furthermore, he becomes angry with someone who does not offer him sashtanga-dandavat pranamas, full prostrated obeisances. Such anger is abominable. Well-mannered people respect an acarya by offering him a separate seat. This is correct and in accordance with sastra, but if the acarya is angered by someone else sitting on that seat, it is most unfortunate. All such behaviour solely arises from the desire for pratishtha. 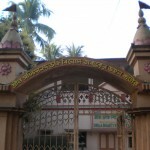 Many Vaishnavas have given up their homes and accepted the dress of a renunciant. Peace-loving people who consider that householders have the greatest desire for pratishtha leave their homes and accept the dress of renunciants. In that renounced situation, however, pratishtha arises with an even greater intensity than before! If one who has accepted the dress of a renunciant is not offered respect, he becomes particularly angry. If the desire for pratishtha is present in householder Vaishnavas and Vaishnavas in the renounced order, what can be said of others? When we collect and contemplate upon the instructions of great people, we understand that as long as we cannot give up the desire for pratishtha, we cannot consider ourselves Vaishnavas. Real humility is not found in mere words. I say that I am not worthy of being the servant of a servant of the Vaishnavas, but all the while within my mind I think that anyone hearing me say this will glorify me, thinking me a pure Vaishnava. What can we gather from the words of this mahajana, Srila Raghunatha dasa Gosvami? We understand that the desire for pratishtha can never be removed by studying and discussing sastra, by hearing instructions from those who have not attained prema, nor by practising various bodily processes of yoga. It can only be removed by associating with and serving visuddha Vaishnavas. Having searched for and found such Vaishnavas, it is our ultimate goal to associate with and serve them. 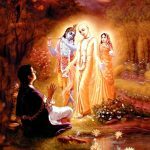 By associating with Vaishnavas, saintliness (sadhuta) will manifest in our hearts and sinfulness will be completely removed. When our hearts are clean, a ray from the sun of prema will enter. This ray, which enriches our hearts with prema, comes from the heart of a saintly Vaishnava. This is the only way to attain prema and give up pratishtha. It is the natural method to become a sadhu. All other approaches are fruitless labour. In conclusion, attaining one’s eternal transcendental nature is non-different from removing one’s temporary material nature. The nature of Krishna-prema is such that it is only entrusted into the heart, of visuddha bhaktas of Krishna and it has no other dwelling place. It is passed from one atma to another, just as lightning passes from one cloud to another. Gradually, by associating with Vaishnavas, the prema in the Vaishnava’s heart is naturally transmitted to the heart of the jiva. At that time wicked tendencies are removed from the heart of that jiva and a saintly nature manifests in him. All the exalted qualities that purify the heart and that accompany prema, become manifest. It is therefore our duty to remove the desire for pratishtha by taking sadhu-sanga.